Brownlee Precision manufactures high performance laboratory amplifiers specifically tailored to the needs of electrophysiology research. These are sold under our brand Brownlee Precision. 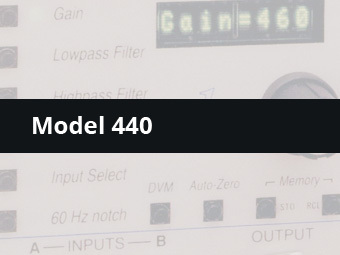 The Model 440 is a four-channel analog amplifier featuring single-ended or differential inputs, high gain, low noise, and a very high impedance input stage. It includes 8-pole Bessel lowpass filtering, highpass filtering, and line frequency notch filtering. Our customers appreciate the bright digital displays, simple front panel knobs for adjusting all settings, and the rugged rack-mountable cabinet.